The NSP is proud to support the new AHDB PCN soil sampling and laboratory guide. “The new PCN sampling guide is a welcome update to the understanding of PCN detection, management and control. To read the full story on this, click here. The potato industry is being urged to take part in a free interactive e-learning course on best practice nematicide usage that has been launched by the NSP and ARTIS. With the cold and wet weather delaying planting and nematicide applications in some areas, now is the perfect time to refresh knowledge on responsible application. “The new online tool aims to encourage and increase the adoption of nematicide stewardship,” says Dr Sharon Hall, chair of the Nematicide Stewardship Programme (NSP). “It’s suitable for all farm staff and operators who handle nematicides, to ensure that they’re applied efficiently, accurately and safely, protecting the consumer, the operator and the environment,” she explains. Developed by ARTIS, the programme will consist of three short 30 minute online modules, the first of which is available online now at www.artistraining.com/e-learning, and focuses on analysis of soil type, potato cyst nematode counts and variety choice when deciding whether to use a nematicide. “The courses are designed to build upon the information delivered at the ARTIS Nematicide Stewardship half day courses, which have seen over 1,295 participants to date,” she explains. “Through commissioning this project, we hope to bring training in best practice use of nematicides to a wider range of participants, and to ensure a permanent up to date resource is available to all. More information on the NSP’s e-learning course and access to best practice advice videos on potato cyst nematode control can be found online at www.nspstewardship.co.uk. The Nematicide Stewardship Programme (NSP) announced a new training partnership with the industry training initiative ARTIS at BP2015, Harrogate 12 November 2015. “We are excited about the training partnership with ARTIS,” says NSP Chair, Dr Sharon Hall. “The use of Nematicides remains critical to many growers in producing a quality product and maintaining current rotations and this new partnership will deliver high quality training on a sustainable basis to the industry”. The NSP group is a joint initiative that brings together the agrochemical companies Certis, DuPont and Syngenta (who have provided funding to establish the workshops). They are working with other NSP members AHDB; AIC; Fresh Potatoes Suppliers Association; NFU; Potato Processors’ Association; and Richard Austin Agriculture Ltd to ensure these vital products remain available for future use on potatoes and other key root crops. Aimed at those who apply the pesticides in the field and relevant to agronomists, farm owners, farm managers and contractors; the training course is the basis of the Nematicide Application Protocol in the Red Tractor Crop protocols for potatoes, onions, parsnips and carrots. The use of nematicides remains under considerable scrutiny, not only from Europe but from environmentalists, health professionals and the general public. Operators need to ensure they are fully up to speed with the correct way to both handle and apply these chemicals. “Potato Cyst Nematode (PCN) is arguably the biggest long term issue for the potato industry,” says AHDB Potatoes Head of Knowledge Transfer, Philip Burgess. “It’s vital all the available tools to control this pest are used effectively and responsibly. NSP is an excellent example of the entire industry coming together to ensure this. Operators who attend will get consistent messages on best practice and will be able to fully comply with stewardship. A new stewardship group plans to work alongside farmers and operators to ensure best practice for all granular nematicide applications this spring and into the future. 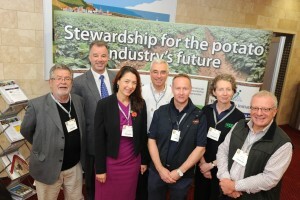 The newly-formed Nematicide Stewardship Programme (NSP) is a joint initiative that brings agrochemical companies Certis, DuPont and Syngenta together for the first time, and includes cross industry support geared to ensure these vital products remain available for future use on potatoes and other key root crops. Launching a user protocol, a series of workshops aimed at educating users, a tractor cab sticker warning users to ‘stop’ three metres before reaching the row end and an eye-catching logo, the group says it’s determined to work to promote the continued safe application of this product range. In common with many ‘actives’ the nematicide product group has come under the scrutiny of European legislators who are increasingly reducing the choices open to farmers keen to protect their crops from a wide range of pests, weeds and diseases. “We must use every opportunity to ensure, as always, that products are used responsibly, cost-efficiently and in accordance with the manufacturers’ recommendations,” says Neil. “We’re leading the market from the front. For example, by March 2017, we’re saying that all applicators must be fitted with a device in cab that allows the operator to shut off nematicide granule flow at least 3 metres from the end of each row. This is to ensure no granules are left on the surface as the machine is lifted and turned. The NSP will be running a series of workshops this spring, and again next autumn, aiming to ensure all operators are fully up to date with the latest legislation, and supplied with the correct information that ensures the products are applied accurately and safely. The area treated and the product volume used match for each field. The new NSP protocol will be included in the new Red Tractor potato protocol which will be issued this spring.